Learn the advantages of hybrid vehicles & how they work. Hybrid technology has advanced significantly in recent years, and Toyota’s Hybrid Synergy Drive continues to lead the technological trend to provide the best level of hybrid efficiency without sacrificing vehicle performance. The advantages of hybrid-electric vehicles include up to 70% less smog-forming emissions than traditional gasoline-only engines, and the freedom provided by never needing to plug in. At McPhillips Toyota we have a full selection of Hybrid cars for sale including the Toyota Highlander Hybrid, luxurious Camry Hybrid, Prius, spacious Prius V, stylish Prius C, and Prius Plug-in-Hybrid. 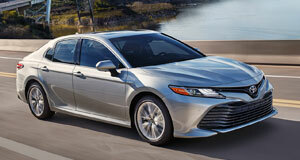 When you compare hybrid cars, there is a reason that Toyota vehicles come out on top. Toyota’s Hybrid Synergy Drive is a full hybrid. That allows it to perform in three distinct modes: gasoline only, electric motor only, or a combination of the two. That allows you the best combination of performance and efficiency available on the market. While it might be hard to choose the best hybrid car from our lineup, we can at least tell you that the best hybrid has to be a Toyota. How do hybrid cars work? Toyota hybrids make use of a gasoline engine as the main source of power. When gradually accelerating from a stop and moving at low speeds, the integrated AC synchronous Electric Drive Motor provides the sole power for your vehicle, drawing energy from your hybrid battery. If your car needs to accelerate quickly, the gasoline and electric drive motors team up to provide power for smooth and powerful acceleration. While you are cruising under normal driving conditions, both motors supply power to the wheels, while the efficient gasoline engine provides a larger percentage of power at higher speeds. On deceleration, a regenerative braking system recovers kinetic energy and stores it in your hybrid battery. 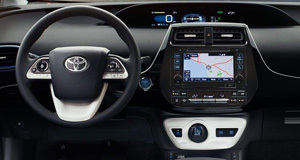 Compare our hybrid cars – Learn about the Toyota Highlander hybrid, Camry hybrid & Prius. 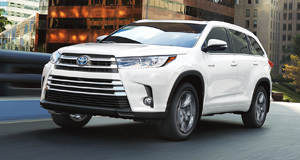 The 2019 Toyota Highlander Hybrid gives you seating for seven or eight with tough SUV capability. A combination of performance and economy gives you the best of both worlds. Available AWD-i will get you where you need to go, while rated fuel consumption of 8.1l/100km city allows you to go further. Learn more about the Toyota Highlander at our online Toyota Showroom. The redesigned 2019 Camry Hybrid provides a world of luxury with super quiet operation, roomy interior, and a wide selection of available tech features. Surprising performance is provided by the Camry’s 2.5L Hybrid Synergy Drive Engine that generates an equivalent 200 horsepower. Learn more about the 2019 Camry & Camry Hybrid. There are a number of Prius hybrid models available including the standard Prius, family-sized Prius V, ultra-efficient Prius Plug-in Hybrid, and the stylish Prius C. Boasting 3rd generation Hybrid Synergy Drive, the Prius continues to deliver unmatched hybrid fuel economy. 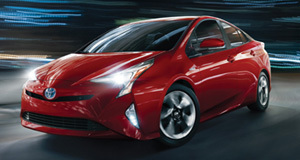 Find Prius prices and specifications at our Toyota Showroom.